Have a question on Rapide S? Rapide S is available in 24 different colors - Lightning Silver, Hammerhead Silver, Kopi Bronze, Silver Blonde, Mariana Blue, Ocellus Teal, Onyx Black, China Grey, Marron Black, Stratus White, Midnight Blue, Jet Black, Sunburst Yellow, Quantum Silver, Diavolo Red, Divine Red, Selene Bronze, Morning Frost White, Concours Blue, Silver Fox, Arizona Bronze, Yellow Tang, Volcano Red and Skyfall Silver. Watch latest video reviews of Aston Martin Rapide S to know about its interiors, exteriors, performance, mileage and more. Founded in 1913, the Aston line-ups are the all time favorite of any motoring enthusiast. Pioneer in manufacturing luxury sports car, this UK based multinational has been a frequent contributor of exotic cars for almost a century. Winged insignia of the brand indicates the dominance of its models when they cruise on the road. Accommodating a newbie under its hood, the brand is out with the new Aston Martin Rapide S. Being the first ever saloon after the discontinuation from Aston Martin Lagonda, the Rapide S was presented as concept at the 2006 North American International Auto Show and its production initiated at 2009 Frankfurt Motor Show. Sharing the VH platform of the DB9, the Rapide S comes revised in performance and aesthetics this time. Interior of the Rapide S is a recipe using the finest ingredients of the automotive industry. Perfectly proportioned cockpit of the hatch is a fully driver oriented concept of the super cars of Aston's line up. Full-grain leather interior with walnut fascia trim and graphite cente console finish would stimulate all your senses when you would step in to the cabin. Electrically adjustable sports seats and leather sports steering would make you feel driving a hyper car. Organic Electroluminescent (OEL) displays with trip computer avails the driver with almost all information parameters required during driving. 1000-watt Bang and Olufsen BeoSound audio system of the Aston comes with ICEpower technology that offers pleasant auditory all in the cabin. Trunk space of 396-litres would be sufficient to store your load of luggages. 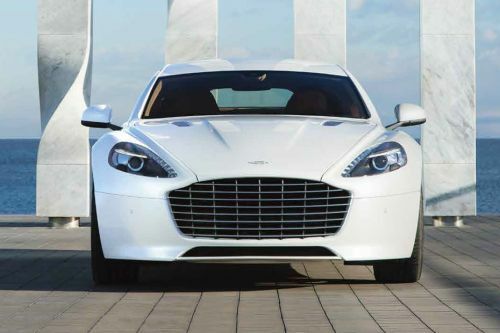 With unrivaled body design, Rapide S stays the segment leader in the factor of aesthetics. Assertive look of saloon is the persona transferred by its traditional chrome embossed radiator grille. Air vents with chrome tinting unified with powerful body lines conveys the message of power and performance it is bestowed with. VH body structure with aluminum and magnesium body composite offers a robust architecture to the dynamic body of the Rapide S. Refreshed tail lamps and chrome dipped exhaust tail tips throws sporty characteristic to the elegant body design of the car. Measurement of 5020mm X 2140mm X 1350mm (L X W X H) offers a kammback structure to the silhouette thus granting it a coupe trait. Silver painted 20-inch alloys of the Aston accommodates a firm grip Pirelli tyre size of 245/35 ZR20 at the front and 295/30 ZR20 to the rear. This astounding masterpiece accommodates a brutal V12 under its seductive hood, which knocks out a maximum power of 550 bhp at 6750 rpm. Rear wheel drive arrangement of the Rapide S boosts out a tyre smoking torque of 620 Nm at 5500 rpm. Innovative 'Touchtronic II' 6-speed transmission of the hatch allows it to rev up from 0-100 kmph in just 4.9 seconds, at the same time with ground-breaking assertive body design, step on the gas and you could end up at top speed of 306 km/h. Sprinting at such a high speed, it still manages to deliver a decent mileage of 7 kmpl, which is truly a milestone for a grand tourer. Six piston monobloc calipers at the front and four piston caliper to the rear offers an effective and safe braking even at high speeds, reason being the anti-lock braking system housed that prevents the wheel locking thus limiting the risk of skidding. Electronic brake force distribution and electronic brake assist enhances the braking performance thus offering adequate amount of brake force to each wheels. Three stage adaptive damping system (ADS) comes housed with aluminum built double wishbones that nourishes the stability of the vehicle while encountering critical turns. Positive torque controller (PTC) and traction control (TC) allows the rubbers to grip the tarmac by regulating the engine torque, thus reducing the risk of slippage caused by instability. With satisfactory appearance and load of gizmos installed to it, the sedan stands a way ahead of its rivals in comfort and elegance. Besides this the performance package it holds will surely make it the best in class performer. But considering the buying factor, the Rapide S is more for the enthusiasts that like to club there office drive and a track day experience in the same car. What is the price of Aston Martin Rapide S? On road prices of Aston Martin Rapide S 5.9L Luxury in is costs at AED965,000 . What are the colors options available in Aston Martin Rapide S?